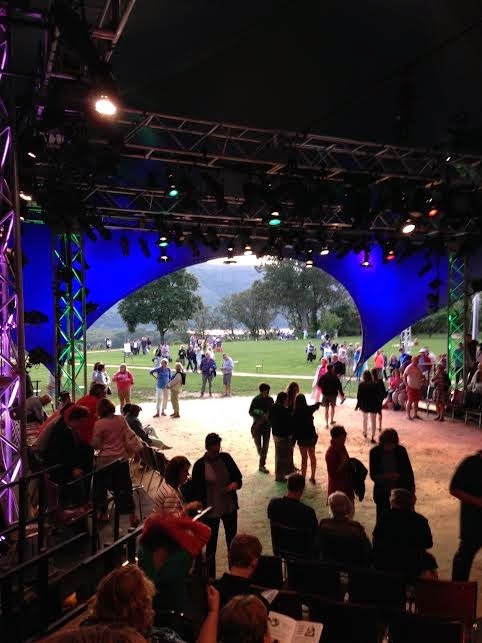 On Saturday, I finally made good on my promise to return to the Hudson Valley Shakespeare Festival. Gratefully, I accepted Amy and Dan's invitation to visit and accompany them in seeing Two Gentlemen of Verona. It was a fabulous weekend in the country! This Two Gents was wonderful. The production is tightly, cleverly, smartly, hilariously directed by Eric Tucker. It was sort of a combination of Roman Holiday, The Umbrellas of Cherbourg, Pret a Porter and Boeing-Boeing (the 2008 Broadway production) - crazy, brightly colored and so very stylish. Costume design is by Rebecca Lustig. Choreography is by Alexandra Beller. Sound design is by William Neal. Props Design is by Sue Rees. Lighting Design is by David Upton. All of this stage production leads to a swanky, magical cocktail of modern and vintage. The cast is nothing less than fabulous: Ethan Saks as Valentine, Andy Rindlisbach as Proteus, Jennifer Johnson as Speed, Magan Wiles as Julia, Nance Williamson as Lucetta/Second Outlaw/Host, Kurt Rhoads as Antonio/Launce, Aryana Sedarati as Silvia/Third Outlaw, Rex O'Reilly as Launce's dog Crab, Cameron Jamarr Davis as Thurio, Leopold Lowe as the Duke of Milan, Oliver Lehne as First Outlaw/Silvia's accomplice. I could not have been more blown away by this cast. Even though Rex O'Reilly threatened to steal all of his scenes with his canine wiles, my favorites were Nance Williamson and Kurt Rhoads. While Rex is making his company debut, Kurt and Nance have worked on 60 shows together. They are a RIOT! Every moment from this entire cast, seasoned and those making their debut alike, delivered hilarity and they danced together like they've been dancing forever. All sorts of shenanigans that actually had nothing to do with the play were happening on the vast lawn that serves as upstage and I loved every minute of it. 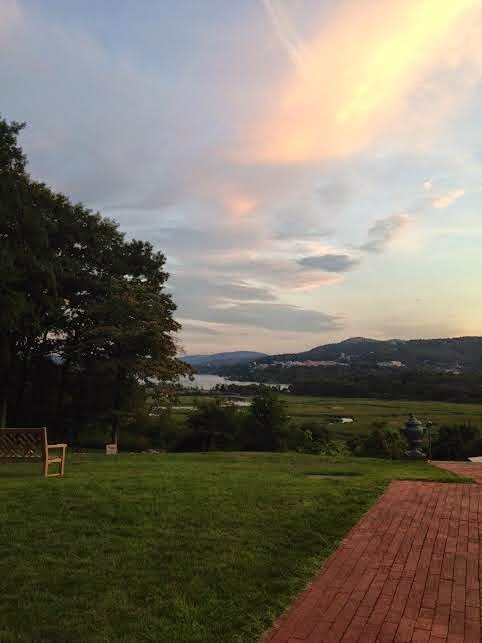 I will seriously not wait so long to return again to the Hudson Valley Shakespeare Festival. It couldn't be easier to get there via the Hudson Valley Line on the Metro North (and it's such a gorgeous ride Billy Joel didn't include a lyric about it for nothin'). The breathtaking landscape that is the stage is as beautiful as any lauded theatre. The price is pretty right as well. The remains of their rep season includes Othello, The Liar by David Ives, and Two Gents until August 31st: http://hvshakespeare.org/.